Image courtesy Lara K Hansen Photography. We can’t believe the first quarter of the year is already gone and Spring has now fully Sprung! With 80’s hair metal music, Frisco Area Children’s Theater bringing back the 50’s, a Texas Hold’Em Tournament for charity, and the last Texas Legends Basketball game of the season, we’ve got all kinds of spring things to do in Frisco this week! The weather is beautiful, so get out of the house and grab some culture! 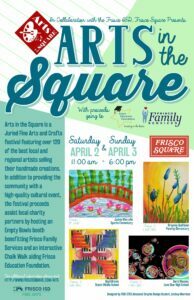 In collaboration with the Frisco Independent School District, Frisco Square presents the 7th Annual Arts in the Square, with proceeds going to the Frisco Education Foundation and Frisco Family Services. This must-see family event happens each spring with Frisco Square transforming into an outdoor fine arts and crafts gallery. Saturday and Sunday April 2-3, 2016 from 11am to 7pm with free admission and parking. “5th Annual Charity Texas Hold’Em Tournament” – Charity Texas Hold ‘Em Tournament benefiting Boys & Girls Clubs of Collin County. Doors open at 6:00 PM ~ Seating begins at 7:00 PM – Tournament begins promptly at 7:30 PM in Gleneagles Country Club – 5401 West Park Blvd Plano, TX 75093. Tournament entry, poker chips and hors d’ oeuvres are complimentary. A cash bar will be provided. Seating is limited. Prizes will be awarded at the end of the evening! Blackjack tables will be available for guests that do not prefer poker. Become a sponsor or buy individual tickets to be part of this fun night. “Texas Legends vs. Oklahoma City Blue” – Tipoff at 7pm in Dr. Pepper for the LAST HOME GAME of the season. Get your Texas Legends Tickets! “Stan’s Main Street” is celebrating their 2nd birthday. So get out and join them for extra specials, live music and more! “The Nifty Fifties” – It’s time to head on back to the Nifty Fifties – fast cars, drive-ins, poodle skirts and soda shops, a time when rock & roll was here to stay. Gracie is in charge of planning the Hippity Hop dance, but the gym is being remodeled. Well, there’s only one place to have it – their favorite after-school hangout! But how to get the kids to come? Invite Ziggy Springer to perform! But can Gracie get her distant … very distant cousin … to perform? Will Mrs. Nicholson even let them have the dance? And who will Donald take to the dance – Gracie or Muffin? Find the answers to these questions and many more at Frisco Area Children’s Theater production of “The Nifty Fifties” by Tim Kelly with music and lyrics by Bill Francoeur. Starting at 7pm, this production in the Black Box Theater is suitable for children of all ages. Tickets are $5 for children (12 and under) and $10 for adults. Produced by special arrangement with Pioneer Drama Service, Inc., Englewood, Colorado. “Poetry Contest” – The Frisco Public Library is sponsoring a poetry contest for students in grades 1-12. Students are invited to submit original poems March 11-April 15. Entry forms are available at the library or at www.friscolibrary.com/poetrycontest. “Inaugural Frisco Maker’s Market” – Join us for the first ever Frisco Maker’s Market! Between 10am and 4pm, the market will be held in the green space behind Lillian Welch and eight 11 place on Main Street in Frisco, Texas. Featuring several local artists and makers, as well as a selection of vintage treasures! Enjoy music and mimosas at eight 11 place, and browse the vendors while listening to the music of Ben Shurr. Entrance is free and all proceeds remain with vendors… Come out and support your local makers at this exciting NEW community event! “7th Annual ARTS IN THE SQUARE” – Returns April 2-3, 2016 in Frisco Square. In collaboration with the Frisco Independent School District, Frisco Square presents Arts in the Square with proceeds going to the Frisco Education Foundation and Frisco Family Services. Arts in the Square 2016 takes place April 2nd and 3rd, and will feature over 120 of some of the best local and regional artists selling their handmade creations. Artists compete in the following categories: Fine Arts/Graphics, Pottery, Textiles, Glass, Jewelry, Leather, Metal, Photography, Wood, and Miscellaneous. So come out, and feast your eyes on incredible art or sit and relax by Simpson Plaza, listen to local musicians, watch ongoing performing arts, enjoy interactive art activities, and treat yourself to the food and spirits available at the variety of award-winning restaurants on site. “Stan’s Main Street” is celebrating their 2nd birthday and the party continues! It’s a perfect place to hang out and watch the game too… what game? Well… just read on! “FC Dallas vs Columbus Crew SC” – Match starts at 8:00pm in Toyota Stadium. Get your FC Dallas tickets! · Pixel Dreams: A 1980s-inspired arcade full of timeless classics such as Asteroids, Centipede, Donkey Kong, Space Invaders and more. · Giant Pong: Play the classic game Pong on the world’s largest home Pong console on a giant 15-foot TV replica from the 1970s. · Head-to-Head Hall: A hall full of gaming stations where you can go head-to-head with friends, family or competitors in tournaments. Guests may find a set of game systems and games they’ve never seen before or find a tribute to their favorite game franchise played on 10 different systems. The hall takes advantage of NVM’s 12,000+ library of games and will be an ever-changing area of fun. · Gearbox Behind-the-Scenes: See the actual office of Randy Pitchford, founder of Gearbox Software and creator of the games Borderlands, Brothers in Arms and Duke Nukem Forever. · The Timeline of Consoles: Learn the stories and see artifacts from more than 50 past and present videogame consoles on a physical timeline. · Rarest artifacts: A collection of rare artifacts will be displayed including the only Sega Neptune prototype, the unreleased Barbie edition for the Nintendo Game Boy Pocket system, the Atari Mindlink controller (one of only two in the world), the ultra-rare RDI Halcyon laserdisc-based game console and the Nintendo World Championships cartridge from 1990. Frisco, TX 75034. Featuring Guest Speakers: Dr. Jeremy Lyon – Superintendent of Frisco Independent School District and Dr. Neil Matkin – President of Collin College. “Frisco City Council Meeting” – The Frisco City Council typically meets the first and third Tuesdays of each month inside the City Council Chamber at the George A. Purefoy Municipal Center, 6101 Frisco Square Blvd. Citizens are welcome to attend the open meeting, which generally begins at 6:30 p.m. Citizens’ input is heard at approximately 7:30 p.m. Can’t join us at City Hall? Follow along online at http://sire.friscotexas.gov/sirepub/meet.aspx and select “View Video” next to the listing for the current meeting date. “Texas Big Star Half and 5K Run” – Join us on April 16th as we make history with the first-ever endurance event in the city of Frisco. The North Texas Community Giving Foundation, in partnership with the Tug McGraw Foundation, is excited to bring the inaugural Texas Big Star Half Marathon & 5K to the community where we live, work, play and give back! Athletes and friends will enjoy a Finishers Fest with entertainment from Emerald City, food from our sponsors and even a fun zone for the kids. You won’t want to miss! Whether as a team or as individual runners, we invite you to be part of this exciting event. Please visit www.runtexasbigstar.com for more information and to register. Questions? Contact us at info@runtexasbigstar.com. “Grand Opening of Frisco Rotary FARMERS MARKET” – On Saturday, May 7th, the Farmers Market returns to downtown Frisco with a new location! On 4th Street between Main and Elm, the Farmers Market will be open every Saturday from 8am to 1pm or Sell Out. A bounty of fresh fruits and vegetables creates a colorful welcome to those who appreciate the “buy fresh, buy local” idea. Seasonal fruits create a spectacular palette! The freshest vegetables in North Dallas will excite your culinary talents! Also available are pasture fed beef, pork, lamb, and the freshest eggs you’ll find. Buy pasta, nuts, cheesecake, muffins, gourmet items, and honey – all fresh! Check out the vendors page for information on all the vendors. Be sure to come by every Saturday starting in May for the best produce and homemade goods in Frisco.